Zabisco Infographic's short video shows why infographics have taken off in the past year or so with PR and media.So much data available -- and graphic representation so much easier than it has ever been. PRNews recently summed up the topic for public relations. 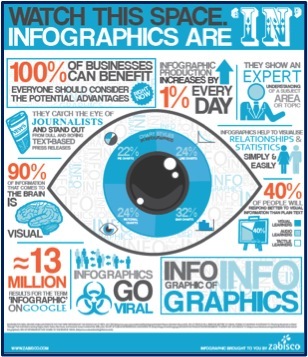 What nobody is struggling with yet, as far as I know, is best practices and guidelines for marketers, PR people, and research companies for understanding and using the potential of infographics. There are as many ways to misrepresent as to communicate. It looks like another instance of the technology getting ahead of the thinking. Some good observations on best practices in this SlideShare from Nicolas Garcia Belmonte: Principles of Analytical Design.